Diffusion of responsibility is a phenomenon in which a person is less likely to take responsibility for an action when others are present. The bystander effect refers to cases where individuals do not offer any means of help to a victim in an emergency situation when they believe that others are present and will assist. Alternatively, diffusion of responsibility can also encompass a person’s refusal to take personal responsibility for their own actions, such as the “only following orders” defense used in the Nuremberg Trials. Refusal to assume personal responsibility for one’s actions or inaction can result in one feeling alienated from society and feeling useless. These are characteristics of Durkheimian anomie. Refusal to assume personal responsibility for one’s actions or inaction can result in one feeling alienated from society and feeling useless, characteristics of Durkheimian anomie. bystander effect: When someone is less likely to help another if other potential helpers are present. diffusion of responsibility: Diffusion of responsibility is a socio-psychological phenomenon whereby a person is less likely to take responsibility for an action (or for inaction) when others are present. Diffusion of responsibility is a socio-psychological phenomenon whereby a person is less likely to take responsibility for an action (or for inaction) when others are present. In such situations, individuals assume that others have already taken responsibility and therefore they have no moral obligation to do so. Alternatively, individuals might feel as though no one can find them responsible because there is no way to single out their behaviors from the rest of the group. Because they will not be forced to take responsibility, they choose not to do so on their own accord. Diffusion of responsibility tends to occur in groups of people above a critical size and when responsibility is not explicitly assigned. It rarely occurs when the person is alone and diffusion increases in groups of three or more. The bystander effect is another phenomenon that is closely related to diffusion of responsibility. It refers to cases where individuals do not offer any means of help to a victim in an emergency situation when they believe that others are present. The probability of helping victims is inversely related to the number of bystanders; the greater the number of bystanders, the less likely it is that any one of them will help. The mere presence of bystanders greatly decreases intervention because as the number of bystanders increases, any given bystander is less likely to interpret the incident as a problem and less likely to assume responsibility for taking action. 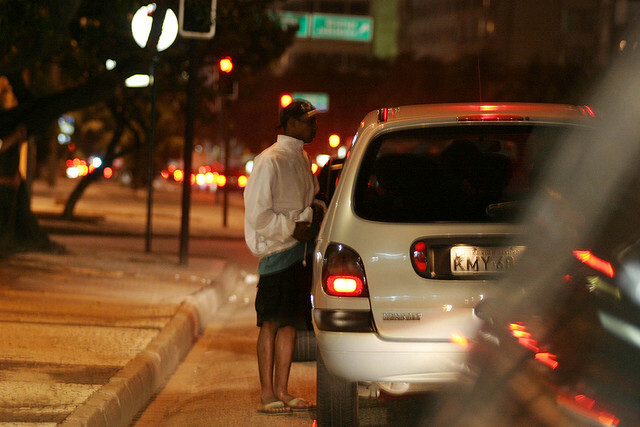 Rio de Janeiro Mugging: Studies have shown that bystanders who observe street crime are unlikely to intervene, often under the belief that others will take responsibility for intervening in the situation. Some have argued that the problems associated with the diffusion of responsibility, particularly the form that manifests as inaction, multiply in urban contexts. When there are more people around, the more likely you are to assume that someone else will do something about the problem rather than fix it yourself. This sense of a lack of individual impact in populous places contributes to the overrepresentation of anomie in urban areas. Anomie was a concept developed by French sociologist Émile Durkheim in his 1897 study Suicide, describing a lack of social norms, or the breakdown of social bonds between an individual and his community ties, resulting in the fragmentation of social identity. According to Durkheim, when one is caught in a normless state in society, one has no parameters to hold on to and, accordingly, cannot situate oneself within that society and becomes socially adrift and isolated. Durkheim writes that anomie is common when the surrounding society has undergone significant changes in its economic fortunes, whether for better or for worse, and more generally, when there is a significant discrepancy between the ideological theories and values commonly professed and what is actually practicable in everyday life. When one feels that he need not take personal responsibility for his actions (or inaction, as it may be) but can instead rely upon the actions of others, one may feel unconnected to society. In this sense, diffusion of responsibility may mean that one feels insignificant and unconnected.